Les Davies of the Environmental Youth Awards explores how the Awards play a part in conveying the importance and special values of our environment to future generations. I don’t think I have seen such an amount of blossom as there has been this year. That’s not just the Apple blossom, but the Blackthorn and Hawthorn have showered the countryside with an ‘icing’ of white, which was then followed by the Elder. There will no doubt be a lot of Elder flower cordial and wine made this time. I however will wait until the sun-drenched berries, loaded with natural sugar, can be turned into the most pleasant of red wines, that will chase away the darkness and cold of a winter’s evening in front of the wood burner. The countryside is catching up after a slow start. It’s not only the greenery of hedgerow and field that seems to spring from the ground, it’s the crops as well. Winter wheat and barley are now ‘heading’ up and it wont be long until they start to change colour as the grain ripens. I hope there will be enough moisture to prevent the grain from shriveling, yet enough sun to ripen it….I don’t ask for much , do I! My garden has also started moving after a very late start. I can’t remember potatoes going in so late as I planted them this year. Most of it would have been my fault, not getting on when I probably should have, but I always find there is a right moment to get on and get things done. Its what my Mother calls ‘The nudge’ and she is so right, things seem to go much better when directed by instinct! Both the Agricultural shows in our area went well this year. For the first time in a while I visited the North Somerset Show at Wraxall. It was a scorching day and the crowds flocked in to enjoy a great family day out. The Royal Bath and West however was not quite so fortunate with the weather, but it has to be said it was not a wash out. First day numbers will have been down, but the Friday brought a pleasant change to the weather after the sudden down pouring of Thursday. A sense of humour is always important, and there was none more required that when in the midst of a sudden heavy shower, (that had caught many without cover or an umbrella) Environmental Youth Award steward Gerry Webb grabbed a microphone and burst into the most wonderful rendition of ‘Singing in the rain’. I must however add that HE was in the dry and those who skipped around outside to his crooning were NOT…. They really had the sense of humour!! These Agricultural Shows show case what is the very best of our rural heritage. Agriculture is after all, responsible for much of our heritage and for our survival. With less than 1.4 of the population engaged in it ,we need all the promotion possible. Farming and our landscape are woven together and interdependent. No one who works the land wants to see it destroyed. It is beholding to all of us to ensure we hand on the importance and special values of our environment to future generations. 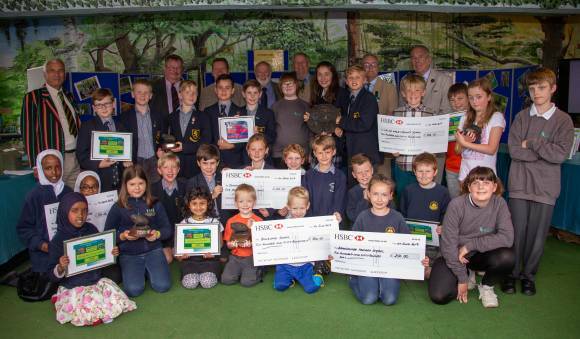 In line with this the Royal Bath & West of England Society, with sponsorship from HSBC UK have now extended the Environmental Youth Awards, (EYA) to cover six counties within the South West. This year, for the first time, entries from East Devon and South Gloucester joined with Bristol, Dorset, Somerset and Wiltshire in the final line up on presentation day at the Royal Bath and West Show. The judges are always worked hard in arriving at their decision , not only of County winner’s but especially the overall Champion of Champions. The EYA scheme is aimed at all youth groups, not just schools, who can show how young people are making a difference to environment. Now in its 22nd year this scheme has encouraged and rewarded hundreds of young people for their drive and determination to protect and enhance the natural environment. Congratulations to Avalon School in Street who won the Somerset nomination and Hannah More School in St Phillips for the Bristol entry. This years overall winner was Dumpton School near Wimborne in Dorset. The awards were made by James Shepherd, Head of Commercial Banking for HSBC in Avon, Gloucestershire and Wiltshire.